Home Motoring Congestion fair game? 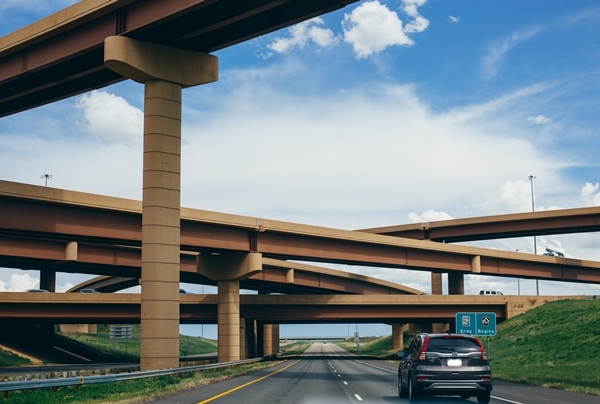 Flyover ramps could take traffic from one on-ramp to the next or more without those vehicles needing to access the motorway proper. Congestion charging is on the drawing board for Auckland with the Government and Auckland Council agreeing on a “smarter pricing” project to investigate costs and how it will work while weighing up pros and cons. The outcome will determine whether congestion charging will proceed, but Rural Living editor HELEN PERRY questions its legitimacy. Questions around the city’s ability to cope with near-term congestion are real enough but I’m doubtful congestion charging is the answer – it’s s time for more innovative thinking on how to move people around this city of ours. Increasing congestion at peak times, as well as at weekends, concerns most of us – 4pm Sunday afternoon on the Southern Motorway (north and south ) is often as heavily congested as weekday mornings! Therefore, I have to ask why huge housing estates are being built in the southern reaches of Auckland which only exacerbate the situation. First, the green light is given to build thousands of houses in areas such as Pokeno, Pukekohe, Drury and Takanini, as an answer to Auckland’s housing crisis. Section sizes (not prices) in many new estates are condensed in order to accommodate tightly packed town houses or terrace housing. But more houses mean more people and, with limited work in these outlying regions, new residents who still need to travel towards the city for work will find themselves penalised if congestion charging is adopted. Road tolls seem fairer as charges would be spread across users at all times; not so congestion charges. Working glide time or remotely may help some avoid charges but for many – service, retail and factory workers – hours are often set in stone making travel at peak times unavoidable. It seems grossly unfair to charge folk who have no choice but to move further afield from work in order to find a home. Perhaps, more family size, low rise apartments should be built closer to the city. Going up is surely an option provided apartments are sensibly designed and are built from long-lasting materials which don’t become an eyesore in a few years. Apartment living closer to the city (not necessarily in downtown Auckland) may bring people closer to their work and perhaps roads would be less congested. Some folk may even use public transport regularly. Although, I am not so sure. Is public transport viable today? In most cases I don’t think so. Lifestyles have changed dramatically over the past 40 years. In the ‘50s and ‘60s, many families had just one family car or did not own a vehicle. Public transport was the acceptable travel mode. In the main, people went to work in the morning on the bus then came straight home after work, except perhaps on late shopping nights. Women with families largely remained at home. The evening meal was ready and waiting for the workers. Supermarkets were few but handy neighbourhood shops provided meat, dairy, fruit and vege. Shopping was done throughout the week with a string kitbag not a metal trolley. But that life has long gone. It is now usual (if not essential) for both partners to work and there are huge pressures on time. We no longer go straight home after work. Instead, we jump in the car and head for the gym, the supermarket or the day-care to pick up children. We meet friends, visit parents, pick up takeaway meals and ferry kids to sports and hobbies; the list goes on. Bussing to and from work is no longer the easy option especially when carrying extra ‘kit’. I don’t think our millennium lifestyle has been properly considered by those calling for more use of public transport. So, perhaps it’s time to become more innovative with roads. Yep, I do say more roads. Interestingly, although motorway works continue between Manurewa and Papakura, the opening of one extra south-bound lane has already eased evening traffic. But what I’m suggesting is going up…in the air! To be fair, our Minister of Transport, the aptly named Simon Bridges has considered this. But, until we can fly home in a drone of one’s own, I think we need a less Jetson-esque solution. On the other hand, flyovers could take traffic from one on-ramp to the next or more without those vehicles needing to access the motorway proper. Worries that traffic will become unbearable are all too real but really, will congestion charging solve the problem? Methinks most people will just ‘cough up’ while breathing in the fumes. This will put further strain on finances and traffic will remain a problem for those who have no choice but to use their cars because of time, distance and commitments, or because public transport is not available, can take just as long (or longer) and actually prove as (or more) expensive. Motorists may well be paying for some road use in the future but I believe, naively perhaps, that fresh ways to accommodate cars still need to be considered because I can see no way that the majority of Aucklanders can do without them. Going up works overseas; maybe it can work here. Food for thought at least but whatever we do, there will be a cost.